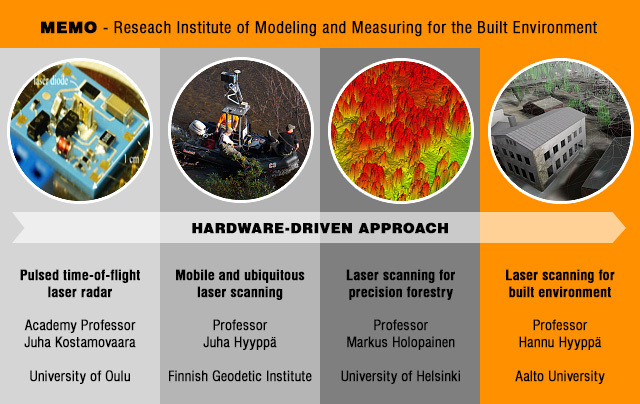 We develop new algorithms, processes and applications with the unique sensor technology unseen possibilities for built, forestry, fluvial environment, and personal mapping. We perform international benchmarkings of methods, sensors and data. We create global infrastructure by giving most of this unique data to open access allowing further development everywhere. We demonstrate future cyberinfrastructure point clouds and its possibilities including multiplatform point cloud collection from car, wheel chair, mobile phone, other personal equipment, and use of that data visualized and analyzed for location-based applications in a 3D game engine combining virtual and physical worlds.